There are 2 sides of the Niagara Falls. The American side and the Canadian side. The Falls is at the situated at the American Side. Before our trip, we read about going to the Canadian side as it overlooks the Falls and where most activities are. But since we travel so far to the Falls, we wanted to the best of both worlds. And we were lucky that we managed to do it! We took a domestic flight from NYC to Buffalo, pick up the car and drove to Niagara Falls. Before we cross the bridge to get to the Canada side, we stopped by the US side of the falls. There's a tower where visitors can have an elevated view of the falls. 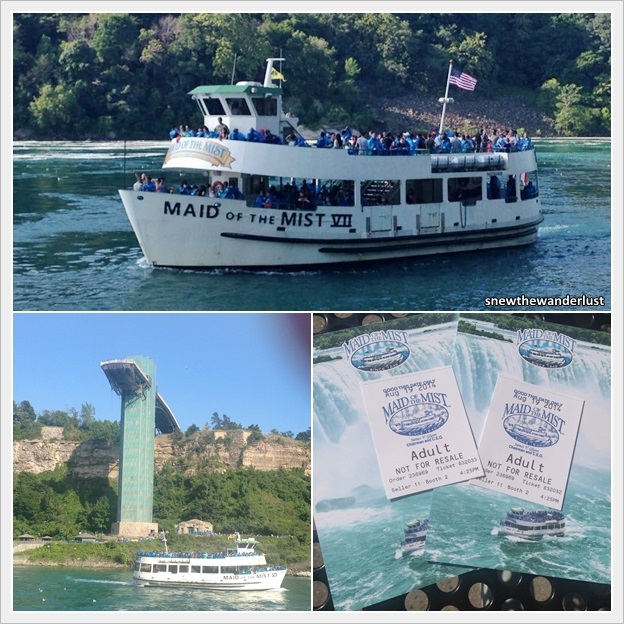 The Maid of the Mist boat tour, located at the American side is not to be missed. While there were reports that the queue may go up more than an hour, we went on a weekday, and it was a breeze getting on the boat tour. Do prepared to get wet as the water pressure is very strong. We were all issued with rain poncho. At some point of time, we have to keep our cameras as we were literally getting drenched! The below photo shows how near, one can get to the Falls onboard Maid of the Mist. Rainbows are common sightings at Niagara Falls. We spotted it everyday, in the late afternoon when I was in Niagara Falls. We were very fortunate that we managed to see this beautiful sighting while on Maid of the Mist on the first day in Niagara Falls, and one can imagine how excited we were! The bustling Niagara town is located in the Canadian side. We crossed over to Canada side without any difficulty via the Rainbow bridge. Again, while there are reports on the jam, it took us just a couple of minutes to clear the customs. In fact, it was much easier to cross this customs, then the Tuas Checkpoint! However, do plan earlier during the peak season. 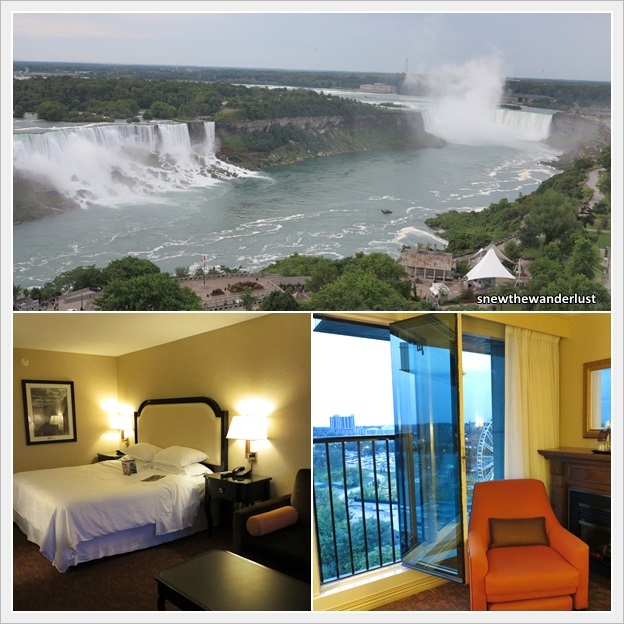 We checked into our hotel, Sheraton on the Falls for 3 nights. It cost us almost a bomb to pay for a room with the Falls view, but we were totally satisfied with our decision. Looking at the location, this is one of the few hotels that offer the closest view of the Falls. This is the view overlooking from our room.We could have gotten a better and newer hotel for the price we paid, but the view makes up for it. At night, the waterfalls are illuminated. During one of the nights, that was fireworks. While visitors squeeze and queue early at the waterfront areas, and enjoy the views at the comfort of our window. Fireworks display happens at 10pm on Friday and Sunday during the summer periods. It is best to check the website for the schedule and plan a trip around those days. A pity that our cameras weren't able to capture the display. The next day, we went on the Hornblower Cruise. It was similar to the Maid of the Mist, but since we enjoy it so much, we decide to go on a second ride, which is on the Canadian side. After that, we also went to the "Journey Behind the Falls". This is one of the must visit journey as we were whisked into the tunnels leading to the Falls. At the end of that journey, we came to the point closes to the Horseshoe Falls. We were astounded by the sound of the strong water pressures, and how near to the falls we could get. A sure experience! From there, we also manage to take the most complete rainbow photo. I would recommend at least a 2-night stay at Niagara Falls at the Canadian side of the falls. This way, you have a full day to explore Niagara Falls. There are also surrounding places to visit at the Niagara on the Lake areas and evening activities surrounding the Falls area. We stayed 3 nights, hence we have time to drive to the Lake area. Will share more on the next post.